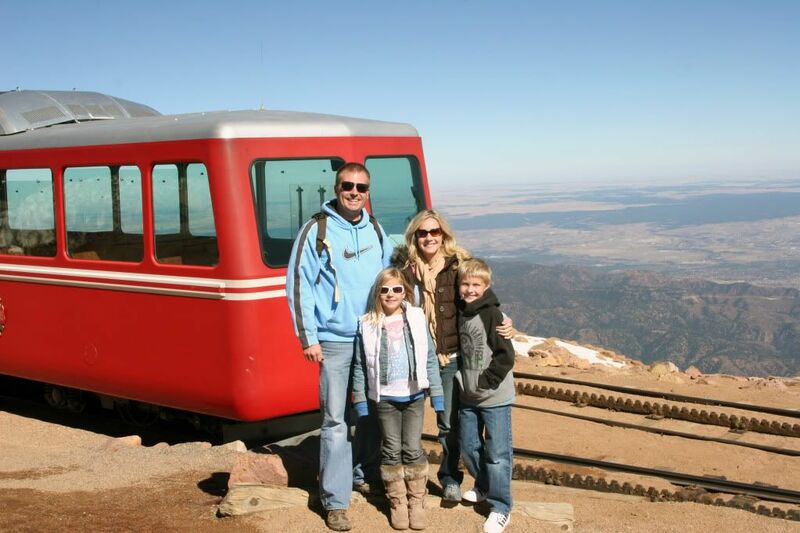 We took a detour today and decided to take a train ride to Pike's Peak, elevation 14,110 ft. It was an amazing feeling being on the top of that mountain, as if we were on the top of the world... and it's only the 2nd tallest peak in Colorado. We were inadequately dressed for the temp at the top. With the wind chill it was 23 degrees. Quite a difference from the 65 degrees we had just come from. We expected it to be cold, but had to make due with what we had. Remember, we had an unknown destination when we started this trip. Makes things a little more interesting that way, that's for sure. I think we did just fine. We didn't freeze and got some amazing photos- definitely worth it. We even managed to grab some fudge before the train left. The Garden of the Gods was just a few miles down the road which worked out well. The kids really enjoyed mining for gem stones and climbing the rocks. Too bad we didn't have more time. Again it was about an hour and a half prior to sunset. There just doesn't seem to be enough time in a day. The rock formations were amazing and we could have spent several days there. But had to move on. We stopped in Brighton, CO for the night and when Haldan pulled off to the hotel we had chosen there were about 7 police cars with flashing lights swarming the building. He was leery, but I was tired and wanted to stop. We've had a full week and I could use some good rest. He found out the police officers were there in response to some drunk guys checked in at the hotel. Haldan joked that he should get a Brighton Police discount and it was granted. Score. Hopefully there is no more trouble. My toe has healed just fine and Pokey's cold seems to be getting better, Unfortunately my rear end is still sore from that horseback ride. I'm pretty sure the saddle wasn't sized correctly. Hopefully the last leg of the trip is bearable. I've really enjoyed the Red Box movies, what a wonderful invention for travelers. We have enjoyed some beautiful scenery and I've taken so many pictures it's been so difficult to choose just one each day. I'll be sad tomorrow when our adventure comes to an end. When I have a chance I'll post a slideshow of my favorite pics from our trip. I forgot to mention yesterday that Little Man made it to the top with such lightening speed that some onlooker from the top thought he was a coyote. Pretty funny. It was amazing how quickly he got up there. It was extremely difficult. It was straight uphill and felt like quick sand. It was so hard to get a good footing and progress forward. It took everything I had to get as far as I did and once I made it the sun was almost completely gone. The temps dropped about 20 degrees and the winds really picked up. I knew we had to leave quick because we still had a good hike back to the bottom. On the way out of the park we saw a herd of elk, must have been at least 40 of them. Amazing. We finally had a sit down dinner tonight and Little Man insisted on eating off the adult menu and NOT the children's. We let him only with the understanding that it wouldn't happen again if he couldn't eat it all. We're still undecided whether he passed or not. He ate all the meat and half of both the sides. His eyes are always larger than his stomach. Fun adventure! Love the pictures especially the sand dune one C: glad you guys could get away!